March 2, 2019 -- VIENNA - The European launch of its new Alphenix interventional angiography system is the major highlight in the booth of Canon Medical Systems at ECR 2019 this week. Other important products being shown include a new entry-level CT scanner for the global market and new global illumination software. First launched at RSNA 2018, Alphenix features a 16-bit digital architecture, which enables a number of new enhancements, such as Illuvis, a noise reduction protocol that cleans up noise in images. Illuvis is particularly useful for cardiac images. 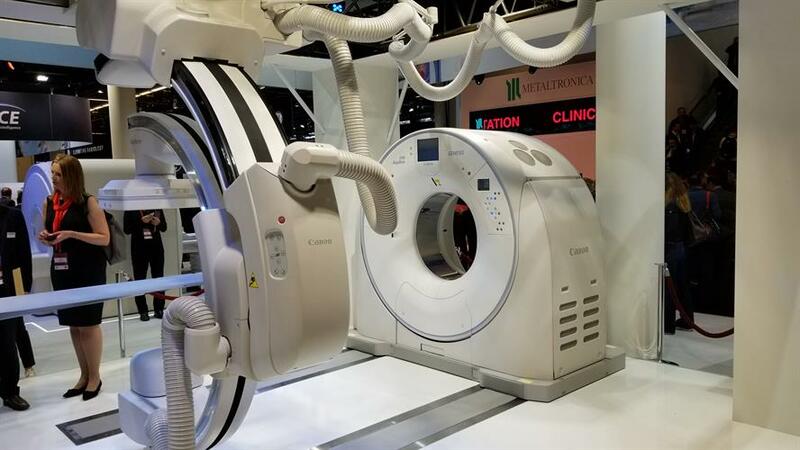 A new Alphenix 4D CT configuration that pairs its Alphenix interventional angiography system with a CT scanner is a highlight in Canon's booth. A conebeam CT mode on Alphenix called AlphaCT was designed for low-contrast imaging, and a real-time autopixel shift mode will clean up images in less than 10 msec, leaving them with less ghosting and artifacts, according to Canon. Alphenix also features a new high-definition flat-panel digital detector that enables users to switch to high-definition imaging at the push of a button, with high-definition resolution down to 6 line pairs/mm. The system also includes a workstation that combines technology from the Infinix workstation with advanced applications from the Vitrea workstation developed by Canon subsidiary Vital Images. This eliminates the need for two separate workstations to run routine and advanced applications. Canon is also showing Alphenix in combination with a CT scanner in a package the company is calling Alphenix 4D CT. The configuration allows interventional physicians to plan, treat, and verify therapy in a single setting. In CT, Aquilion Start is a new line of entry-level CT scanners for the international market, available in 16- and 32-slice configurations. Canon built a high level of automation into the systems, such as single-button positioning, making the scanners well-suited for facilities where highly trained personnel might not be available at all hours. The Start scanners have many of the same features as Canon's high-end systems, such as Canon's PureVision detector, first introduced in the company's premium CT line, and the fourth-generation version of its iterative reconstruction protocol, Adaptive Iterative Dose Reduction (AIDR) 3D Enhanced. The scanner features a 78-cm bore width and 47-mm patient couch, which can be lowered to a height of 31.2 cm to make it easier to transfer patients from a wheelchair. On the CT image processing side, Canon is touting its Advanced Intelligent Clear-IQ Engine (AiCE), an image-enhancement algorithm based on artificial intelligence that Canon debuted at RSNA 2018. Highlights in ultrasound include a-series, a new line of midrange ultrasound scanners that Canon also introduced at RSNA 2018. The a-series systems offer the same ergonomics and workflow as Canon's i-series premium systems, but at a midrange price point. Canon is also highlighting a new 33-MHz linear transducer for its Aplio i800 ultrasound scanner at ECR 2019. The probe features the company's Intelligent Dynamic Microslice (iDMS) and Superb Microvascular Imaging (SMI) technologies, and it enables clinicians to use the scanner for superficial subcutaneous imaging, as well as exams of small joints, superficial nerves, and superficial vascular structures. In image processing, Canon is pointing to its work in global illumination, a technique that produces photorealistic images from medical imaging data. Global illumination is standard on every Vitrea workstation the company ships, and it works in real-time, the company noted. Vitrea users in the field can also have their software upgraded to perform the technique. In MRI, the Vantage Orian 1.5-tesla scanner is being promoted, with a new slim gradient package with a 45-mT/m amplitude and 200-T/m/sec slew rate. A detachable table option is also available that allows patients to be prepped outside the scanning room to improve throughput. Two new software features are also available for both Orian and the 3-tesla Vantage Galan scanner: SureVOI Knee and KneeLine+ allow clinicians to do quick automated localizing scans of the knee for improved workflow, with more than 95% accuracy for aligning anatomy, and WFS Dixon allows clinicians to take four contrasts in just one scan with a fast spin-echo sequence, including in-phase, opposed-phase, water, and fat images. Another application, Quick Star, enables the acquisition of free-breathing images in regions that traditionally require patients to hold their breath. A radial data acquisition technique helps reduce motion artifacts in the abdomen and also allows exams to be completed with fewer breath-holds and greater patient comfort.